इस लेख का मूल्यांकन करे Love playing Gardenscapes: New Acres? So do we! We’ve spent hours pouring over the puzzles in the game and well, needless to say, we’ve got some tips to share with you all! Gardenscapes: New Acres is among the hottest match-3 puzzle games out there right now. 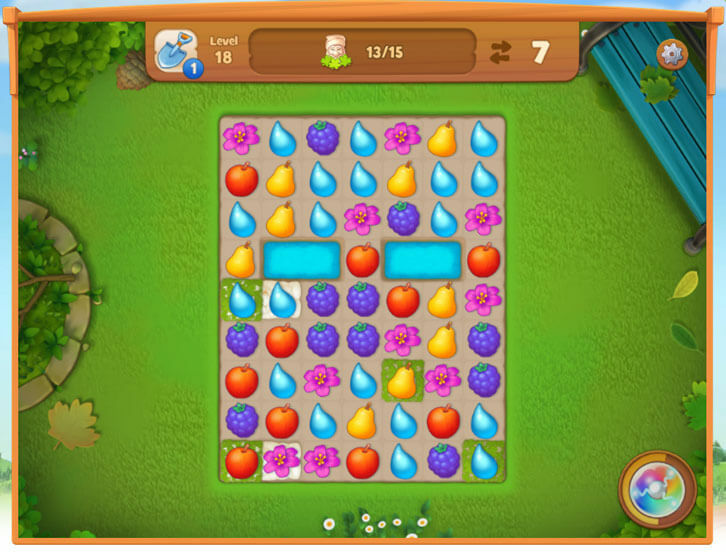 As a player of said game, it is only natural to want to find tips or as some may call them, “legit game hacks”, that you can use to make your gaming experience a whole better and markedly less frustrating especially if you keep failing a level. One of the biggest and most important tips that we can give you is to focus on the objective. Be sure to take note of the level goals prior to starting a game, be it collecting all the hidden garden gnomes or collecting a certain number of a specific type of fruits. Don’t get side-tracked by other stuff like obstacles that aren’t completely cleared when you aren’t required to do that. Sometimes, you can just leave them be. The other two important things you should most definitely learn as soon as you can are “how to form each of the special power-ups (matches of 4 or more)” and “how to use them to their maximum potential”. Thankfully, you’ve got the tutorial to help you in this aspect but if you’re the sort who usually skip through all the tutorials, you might want to hold on a bit and pay attention. The tutorial only pops up now and then, and it doesn’t take a lot of your time. Aside from these power-ups, there’s another vital and yet completely-free power-up that you can use – the Rainbow Blast. This power-up is absolutely crucial in levels where you have to collect a ridiculously large number of fruits of a specific color. However, to get this power-up, you should know that you’ll need to cause some explosions – the bigger, the better – to charge up the meter. Once full, the game will automatically add the power-up to your game board. As you play, you’ll earn coins as well. These coins can be spent on a wide variety of useful items and hence, it is wise to not spend them unnecessarily such as speeding up tasks. However, sometimes, you just need to be willing to use these coins too. As a rule of thumb, we only spend our coins in very tough levels that just need a shovel to remove a hard-to-reach piece, or 5 more (or less) extra moves to complete – nothing more. If you can’t be certain that spending your coins will complete a level for you, then you mustn’t spend them. In fact, it might actually be more “financially beneficial” for you to simply fail the level, lose a life and start all over. Once all 5 lives are depleted, you can then decide whether or not to spend 900 coins on a life refill just so you can continue playing. 900 coins is the exact same cost you’ll need to cough up just to buy 5 more moves, by the way. Need more coins? Well, if you do decide to spend real money to buy more coins, you should take full advantage of the Gold Reserve early on. The reserve allows you to accumulate a maximum of 5000 coins by playing levels, which are generally easier at the beginning, within 6 days and then buy this 5000 coins for flat rate of $2.99. This may not beat the special 40% off promotion that you’ll get where you can purchase 5500 coins for the exact same price, but considering that the 40% off is a special promotion which you rarely see, the Gold Reserve is definitely a more reliable bet for you. So, these are all the tips we have for Gardenscapes. Hope they help and have fun gaming!